Gift-giving is one of the trickiest things. Family, especially, never seem to get it right. Special occasions such as Mother’s Day and graduations can prove to be even more delicate. Instead of gifting a sweater you assume they will love, why not give your loved ones the choice? Even better – give them an experience they will always remember. Clothing and even jewelry get stored away in the closet to be forgotten, whereas good experiences are easier to recall in the mind and bring warmth to a person almost instantly. I recently had the pleasure of participating in a breathtaking experience via the gifting company Excitations. Their website (www.excitations.com) makes gift-giving easy and fun. Excitations.com offers the gift buyer a simple way to give creative and memorable life experiences. What this company understands is that we have a diverse mix of people in our lives. Because of this fact, Excitations offers a wide range of unique experiences. These distinctive encounters are provided by their network of ‘Experience Partners.’ Their partners are located in various locations across the U.S. and offer exclusive options only available to Excitations customers. Excitations’ partners come to them in a variety of ways. First, they conduct research for creative things to do around the U.S. Then, they seek out partners who are experts in their field. It all began with my urge to have/gift a romantic evening with my husband post-newborn baby. Searching through the site for something in your local area is convenient and also gets the creative juices flowing amidst all the options. I have been a long advocate of “travelling” in your own backyard. In my case of Miami, FL – staying a weekend at the Biltmore, riding in a catamaran in the Keys. We ended up choosing the “Full Moon Kayak Tour.” The experience was picturesque as we got to row by the light of the moon. Our skilled guides at the Oleta River State Park led us through a peaceful two hour tour. 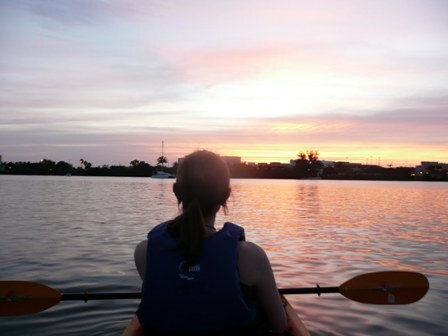 Beginners (like me) and advanced paddlers (like my husband) were able to enjoy this kayaking trip while basking in the striking scenery of mangroves and the city skyline under a full moon. Excitations helped us all along the process – from an easy search and purchase process to email confirmations, and a reminder of our forthcoming experience two days prior. Overall, my escapade had tinges of romance, adventure, team-building and affordability – all of the characteristics I was looking for in regards to this particular gift/experience. -Gift cards are also available!